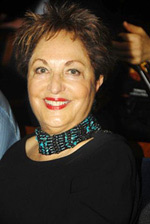 The patron of the Kibbutz Contemporary Dance Company, is a social activist, philanthropist, president and co-owner of Strauss Investment Company, and an ardent supporter of Israel, the Galilee, and its culture. Raya has most recently provided significant support to the ‘Israel 15 Vision’ in partnership with the Reut Institute; a project aimed in improving the quality of life in the Western Galilee region of northern Israel. The initial phase of the program taking place in the Western Galilee, includes the launching of a unique tourism venture of which the activities of KCDC and the International Dance Village are an integral part. She is the Chairperson of Partnership2Gether (formerly known as Partnership 2000); a project connecting 47 cities and regions in Israel to 550 Jewish communities worldwide. Amongst her social and philanthropic activities, Raya has focused on promoting excellence in business and social ethics as well as providing opportunities for at risk youth. Her involvement and support of such projects along with many others supporting the development of excellence in the Galilee region and Israel at large, prompted the invitation and great honor to light the ceremonial torch at the national ceremony on Israel’s 62nd Independence Day. Her longstanding support of Kibbutz Contemporary Dance Company has enabled the creation and the continued development of the International Dance Village in Kibbutz Ga’aton, home to the KCDC and its plethora of cultural, artistic, social, and educational activity.